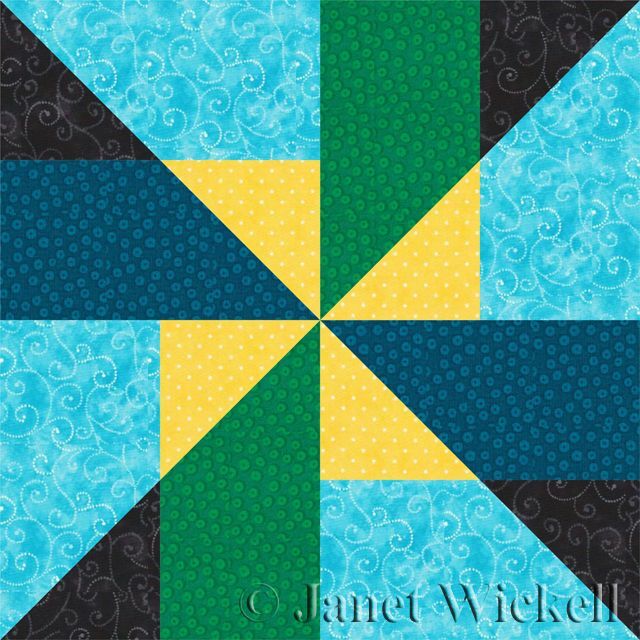 This easy pinwheel quilt block, called Can't Stop Spinnin', is assembled using one simple unit that's sewn in different color combinations. The block might appear to be complicated, but it's actually very easy to make. The color selections are included to help make piecing instructions clear, and to give you guidelines for color value placement, but choose fabrics and colors that appeal to your tastes. Be sure to refer to the illustrations as you sew. Sewing pieces in mirror image positions will change the block's layout. The instructions make one pinwheel quilt block. Repeat to make more. Use a 1/4" seam allowance for all seams. Cut all pieces with the fabric's straight grain parallel to outer edges. Draw a diagonal line from corner to corner on the reverse side of each 3-1/2 inch square, yellow and black. Use chalk or a light colored pencil on the black squares (not shown). Place a yellow square at one end of a medium green rectangle, right sides together and edges matching exactly. Sew a seam from corner to corner as shown above, following the marked line on the square. Press to set the seam, then cut through both layers to remove excess fabric, leaving an approximate 1/4" seam allowance on the triangular shaped side of the unit. Carefully press the seam allowance towards the green rectangle. Some quilters prefer to press the seam allowance before trimming-back. Try both methods to see which works best for you. If your squares are not made from a very light, transparent fabric, it's fine to press towards the squares on these and all other units. Sew a yellow square to the end of each medium blue rectangle. Trim just as you did the previous units. Now sew a black square to the end of each light blue rectangle. Trim and press as before. Sew a yellow/green unit to a light blue/black unit, arranging them as shown above. Press the seam allowance in either direction. Repeat to make a second identical unit. Sew a yellow/medium blue unit to a light blue/black unit, arranging them as shown. Press the seam allowance in either direction. Repeat to make a second identical unit. Arrange the pinwheel quilt block components as shown above, turning the pieced units so that the yellow triangles form a pinwheel at the block's center. Sew the top two units together. Press seam allowance toward the green rectangle. Repeat, sewing the bottom components together, again pressing toward the green rectangle. Join the two halves to complete the pinwheel block. Press. The layout above illustrates how sixteen identical pinwheel quilt blocks would look if sewn in a straight layout --- side by side.